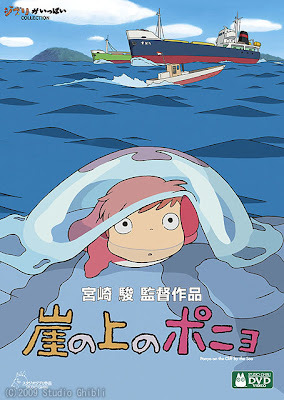 Ponyo on a Cliff by the Sea won't be shown here in the USA until late summer, but the Japanese will see their beloved Miyazaki film on DVD July3. As is standard with Studio Ghibli features, there will be a standard and deluxe DVD package, and English-language subtitles will be included. The deluxe DVD promises to be something extra special. In addition to the feature film, this DVD set will also include a 12-hour making-of documentary. The last time something this extensive was performed was for Princess Mononoke a decade ago, so this will really be a treat. 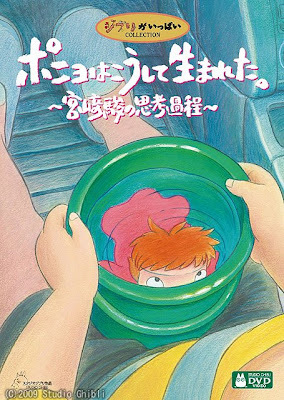 Unfortunately, there most likely won't be any subtitles for the documentary, but we can always cross our fingers and hope Disney includes it as part of the future Ponyo DVD release in the States. It's a bit funny that the DVD will be available over there before the movie is shown here in the States, but I think we'll be strong enough to hold out just a little while longer. Watching a Miyazaki film on the big screen is a rare enough treat. You won't want to spoil that experience for anything. Oh, and I'm really hoping that Disney uses the Japanese poster over here. That's a really terrific poster, don't ya think? Only a few months more to go, kids!